We said back in March that the upcoming multiplayer FPS Escape From Tarkov is "taking gun customization to absurd heights.” The game's gun selection is extensive, and each weapon can be broken down into remarkably detailed components. You can even strip them down and watch the internal mechanisms working as they fire, although that's not particularly good for them in combat. And combat is what it's all about, after all. The new footage is “raw alpha,” which I guess indicates that it's different from straight-up alpha gameplay somehow. Whatever it means, it looks good, and it sounds great, too: The gunfire has real weight, and nothing embodies the spirit of angry men trying to kill each other than shouting in Russian. 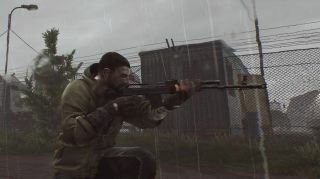 I will always lament the absence of a single-player campaign, especially since Escape From Tarkov is so reminiscent of the great post-Chernobyl FPS Stalker, but I'm still really looking forward to giving it a try. When that will be is anyone's guess, but you can sign up for closed beta access at escapefromtarkov.com.